Yorkshire's Jack Brooks, left, and Andrew Gale celebrate the wicket of Tom Fell, caught by England-bound Jonny Bairstow (Picture: Dave Williams/cricketphotos.co.uk). THE loudest cheers of the day came during the tea break. “Ladies and gentlemen, Jonny Bairstow has been named in the England squad for the third Ashes Test,” came the announcement over the PA system. Cue much appreciative applause from the North Marine Road crowd. Yorkshire folk love their Yorkshire cricket, but they are never so one-eyed as to begrudge one of their own getting a chance at the highest level. And none are more deserving of that chance than Bairstow, whose departure to England after this game will be offset by the return to county colours of the man he is replacing – Yorkshire’s Gary Ballance. The good Lord giveth, and the good Lord taketh away. Whatever happens, though, Yorkshire inevitably find a way to cope. 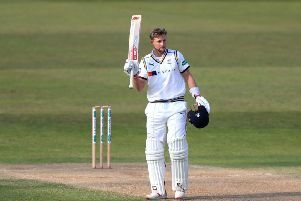 As Bairstow prepares to ready himself for facing the Australians, both he and Yorkshire are aiming for a win that would extend the club’s lead at the top of the County Championship. They are being made to work hard for it by a Worcestershire side who are second-bottom but who have belied their status as relegation fodder. The visitors head into the final day on 221-6 in their second innings, a lead of 71. Having been made to follow-on 150 runs behind, they will have hopes of leaving a tricky target, although a Yorkshire victory is the likeliest outcome. Whatever happens, the match has become unexpectedly interesting – a bit like a novel that has proceeded along fairly predictable lines before the suggestion of a stunning late twist. The weather could yet come into it, for showers are forecast for the East Yorkshire coast. Twenty-eight overs have been lost as it is. Given the grey skies that clung to the ground for much of yesterday, it is a surprise that we have not had further interruptions. In clammy conditions, Worcestershire resumed on 195-6 needing a further 86 to avoid being asked to bat again. They got off to a flier, 24 runs coming from the first five overs from Liam Plunkett and Jack Brooks. Andrew Gale quickly pulled the plug on that policy, introducing the pace of Ryan Sidebottom from the Trafalgar Square and the spin of Adil Rashid from the Pavilion End, and the move paid off. Only three runs came from the next five overs, including the wicket of Joe Clarke, whose overnight 76 – already a career-best display – was curtailed at 88 when he edged Sidebottom to Alex Lees at first slip. Clarke, 19, played an innings of striking composure and he appears to be a player to watch. Steve Rhodes, the Worcestershire director of cricket, called it one of the best innings he had seen from one so young, particularly against an attack as strong as Yorkshire’s. Rashid, bristling with invention, trapped the other overnight batsman, Joe Leach, with a ball that went straight on before taking the pad. The leg-spinner then reduced Worcestershire to 242-9 when Jack Shantry pushed to Lees at silly mid-off. With 39 still needed to avoid the follow-on, Saeed Ajmal, the No 10, chanced his arm to profitable effect. Three fours came off an over from Plunkett, who conceded 21 from two overs in total after he was brought back to replace the full-and-straight strategy that Sidebottom had followed. It looked as though Yorkshire’s tactics would backfire – not least when Gale missed a sharp reflex chance at short-leg offered by last man Charlie Morris off Plunkett with the total on 269. But with just one run needed to escape the follow-on, Tim Bresnan bowled Ajmal for 37, made from just 30 balls with seven fours, and the majority of a 3,500 crowd breathed a sigh of relief. Worcestershire began their second innings 25 minutes before lunch and were soon in distress when Richard Oliver fell just before the break. The left-hander tried to work Bresnan through leg and was trapped lbw as the visitors fell to 18-1. Bresnan should have had a second wicket in the second over after lunch, but Lees grassed a low opportunity to his left at first slip before Tom Fell had scored. The total had reached 65 before Brooks finally got Fell, who top-edged a hook that wicketkeeper Jonny Bairstow watched safely into his gloves. The pendulum swung back towards Yorkshire when they made a double breakthrough in the run-up to tea. Brooks had Daryl Mitchell caught at first slip by Lees, and Rashid bowled Clarke with a big-turning leg-spinner that left Worcestershire 95-4. But Brett D’Oliveira and Ross Whiteley added 100 for the fifth wicket in 27 overs, clearing the deficit and frustrating the hosts. Plunkett finally got D’Oliveira caught at square-leg by Brooks, closely followed by the wicket of Ben Cox fending to Jack Leaning at second slip, but Whiteley held on. Dropped on 26 by Sidebottom at mid-on off Bresnan, he had reached 65 at stumps, made from 104 balls with eight fours and a six.